It used to be, that next to the collapsible sections in the Content Editor tab; the section icon would display on the tab. This made it very easy for me to identify the section I was looking for. In recent Sitecore versions, this has gone away. I presume it has to do with the Content Editor moving to SPEAK but I am not sure. Is there any way to get this back? A setting or so? And if not, does anyone have an example of how this functionality could be overridden to bring the icons back in? 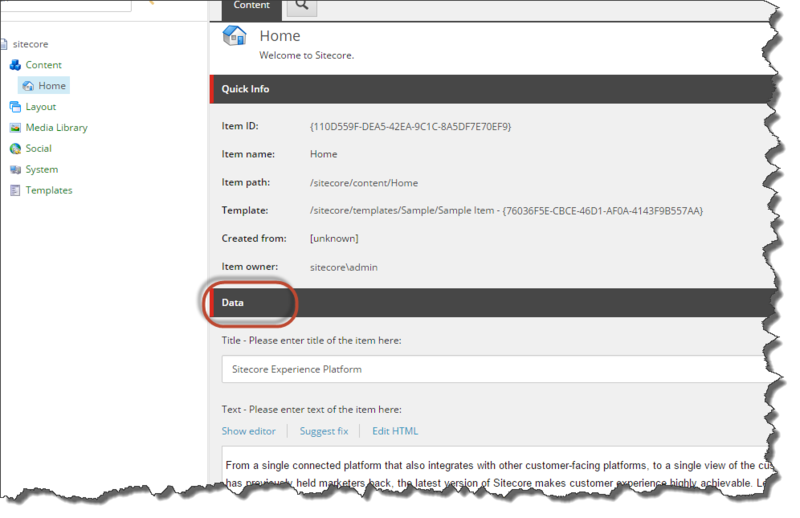 Sitecore supports two ways to render the Content Editor. The pipeline you want to focus on is <renderContentEditor>. For the purpose of this answer, I'll focus on how to override the Standard Content Editor. I would probably advocate for using the Theme/Skinning option that is available, but will need to defer that answer until I am more versed in how to do the themeing. Digging down further, you'll find that RenderSections is calling RenderSectionBegin(...). The real issue with the Section Icon going away is that Sitecore decided just not to render the image. But as you can see from the decompiled code below, Sitecore still supports the section icon, just never utilizes it. imageBuilder2 contains everything that we need to know in order to render the Section icon. however, scanning this method, imageBuild2 is never utilized. Instead, immediately after imageBuilder2 is created, it writes the displayName. You'll note that it's sending the image to the htmlTextWriter which sets up an awesome example as to how to implement the section icon as well. This actually smells like a Sitecore Bug. However, if it's completely intentional, and you want to activate the icon, I would create a custom RenderContentEditor pipeline processor, extend the EditorFormatter class and override RenderSectionBegin method, sending the icon to the HtmlTextWriter. Responding to @jammykam's comment, the amount of code changes that this would require, the reward gained by getting the icon back may not be worth it (in fact not worth it). One must take into consideration upgradability, and maintainability. Using a new processor, as described above, allows you to pull out the change relatively quickly and the approach above does not harm core functionality. However, if changes occur with this class (as they most certainly will) in order to maintain the icons, you'd have to update this custom class. Lastly, while my professional recommendation is to not utilize all of this, just for the icon, and nor do I think creating a whole new XML Skin just for icon make sense either, this is a often requested feature from client who are used to the section icon. Therefore my true feeling is to appeal to Sitecore to offer an easier toggle, config setting or otherwise, in order to display it. Otherwise, I would advocate against trying to implement this at all. The simple answer is that when Sitecore redesigned the content editor for 8.0, they removed icons from the sections, probably to keep the design cleaner. Not the answer you're looking for? Browse other questions tagged content-editor speak or ask your own question. How to show a simple dialog like confirm/alert to the content editor without requiring a deployment? How to open the content editor from SPEAK?